Our TeaForHealth was developed by Dr. Sin Hang Lee. Born in Hong Kong, Sin Hang Lee, M.D., a practicing pathologist in New Haven, Connecticut, graduated from Wuhan Medical College, China, in 1956 and is qualified to practice medicine in the United States, Canada and the United Kingdom. He is certified as a medical specialist in pathology by the American Board of Pathology and by the Royal College of Physicians and Surgeons of Canada. He obtained the F.R.C.P. (C) degree in 1966. Dr. Lee's postgraduate training and academic experiences took place at Sichuan Medical College, University of Hong Kong, New York Hospital-Cornell Medical Center, Memorial Hospital for Cancer and Allied Diseases, McGill University and Yale University, summarized in the Marquis Who's Who in the World, 7th Edition (1984-1985) and in Who's Who in Frontiers of Science and Technology, 2nd Edition (1985). Dr. Lee has been practicing pathology in New Haven, Connecticut, since 1971 with past and current affiliations listed in the 2003 edition of Marquis Who's Who in America. 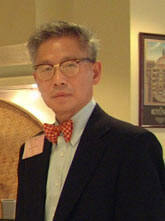 Dr. Lee's research interests range from cell biology to cancer. He and Dr. Timothy Ts'o first reported that lung cancer is a leading malignant tumor among the Chinese living in Hong Kong in the British Journal of Cancer (Vol. 17, pp. 37-40, 1963). In contrast to the data reported by others, adenocarcinoma, not squamous cell carcinoma, was found to be the most prevalent type of lung cancer, especially in women. This observation has since been confirmed by other pathologists around the world. Dr. Lee patented the first FDA-approved histochemical estrogen receptor assay for breast cancers based on his work published in Cancer (Vol. 44, pages 1-12, 1979). This assay identifies human breast cancers that may respond to hormonal manipulation or tamoxifen treatment. Dr. Lee has also patented the most specific FDA-approved method for the serologic diagnosis of Mycoplasma pneumoniae infection. Lee S H, Vigliotti VS, Vigliotti JS, Pappu S. Routine human papillomavirus genotyping by DNA sequencing in community hospital laboratories. Infect Agent Cancer 2007; 2:11. Lee S H, Vigliotti VS, Pappu S. DNA Sequencing Validation of Chlamydia trachomatis and Neisseria gonorrhoeae Nucleic Acid Tests. Am J Clin Pathol. 2008; 129:852-859. Lee S H, Vigliotti VS, Pappu S. Human papillomavirus (HPV) infection among women in a representative rural and suburban population of the United States. Inter J Gyn Ob. 2009; 105:210-214. Lee S H, Vigliotti VS, Pappu S. Molecular tests for human papillomavirus (HPV), Chlamydia trachomatis and Neisseria gonorrhoeae in liquid-based cytology specimen. BMC Women’s Health 2009; 9:8. Lee S H, Vigliotti VS, Vigliotti JS, Pappu S. Validation of human papillomavirus genotyping by signature DNA sequence analysis. BMC Clin Pathol. 2009; 9:3. Lee S H, Vigliotti VS, Pappu S. Signature sequence validation of human papillomavirus type 16 (HPV-16) in clinical specimens. J Clin Path. 2010; 63:235-239. Lee S H, Vigliotti VS, Vigliotti JS, Jones W, Pappu S. Increased sensitivity and specificity of Borrelia burgdorferi 16S ribosomal DNA detection. Am J Clin Path. 2010; April issue (in press).